This month countries around the world made a public statement of grief. Every 25 seconds a life is lost on the world’s roads, leaving more than 3,000 families every day picking up the pieces. The young and the poor are disproportionally affected: nine out of ten casualties on the road occur in low- and middle-income countries; road traffic injuries are the leading cause of death for young people. Without action, annual road deaths are forecast to rise to 1.9 million people within seven years. The World Day of Remembrance for Road Traffic Victims, on November 18th this year, helps governments raise awareness of the tragic effects of road traffic crashes. It offers an opportunity not only to publicly mourn those killed or injured on the road, but also to acknowledge the work of all those who save lives after a crash – police and ambulance personnel, doctors, nurses, and counselors. More than anything else it says, this is unacceptable: we will not continue to lose our brothers, mothers, children, and friends to preventable road accidents. Let’s spread their message. UN chief spotlights road safety as traffic accidents claim 1.2 million lives each year – "This year, the world's roads have claimed some 1.2 million lives," Mr. Ban said in his message marking World Day of Remembrance for Road Traffic Victims. "Added to the fatalities are the more than 50 million people injured each year – many of them now condemned to enduring physical disabilities and psychological trauma for the rest of their days." 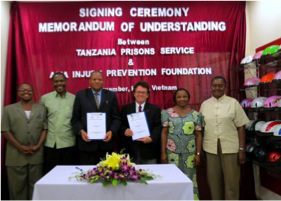 A delegation from the Tanzania Ministry of Home Affairs, Tanzania Prisons Service (TPS), and the Helmet Vaccine Initiative Tanzania arrived in Hanoi from Dar es Salaam on November 19th for a four-day visit to investigate helmet production and advocacy projects in Vietnam. Led by General John C. Minja, Tanzania Commissioner General of Prisons, the group was welcomed by the AIP Foundation in Hanoi. During their stay, the delegation toured the AIP Foundation Protec helmet factory, as well as school-based traffic safety program and helmet-monitoring project sites. A high-level meeting with the National Traffic Safety Committee on November 20th provided an opportunity to exchange ideas and for the delegation to learn about Vietnam's renown road safety successes over the past ten years. A Tanzanian government action plan aims to establish a helmet factory in their country based on the Protec model. The factory will be developed by TPS, a division of the Tanzania Ministry of Home Affairs. TPS signed a Memorandum of Understanding with AIP Foundation on November 22nd in Hanoi as the first step in developing a technical and implementation plan. The factory will create jobs in Tanzania and provide high-quality helmets to the regional market in East Africa. Regional Director Ms. Lotte Brondum and Program Coordinators Ms. Bui Diem Hong and Ms. Kim Phuong Dinh represented AIP Foundation and the Global Helmet Vaccine Initiative at the International Conference for Sustainable Development and Road Safety in Vietnam 2012 on November 22nd and 23rd. More than 500 Vietnamese and foreign scientists and experts joined co-hosts National Traffic Safety Committee and the World Bank for the two-day conference to help Vietnam develop plans to improve traffic safety on roads nationwide. 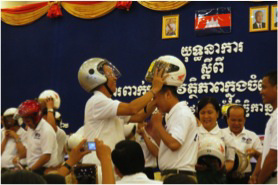 Vietnam's tale of two helmets – Vietnam, where more than nine out of 10 registered vehicles are motorcycles and each household typically owns two, is grappling with how to boost road safety. Each year close to 15,000 people (out of a population of 86 million) die in traffic-related accidents, mostly motorbikes. 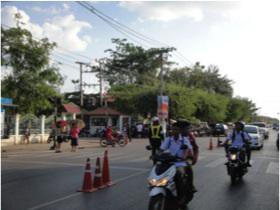 17 primary schools in Central Vietnam and three schools in Dong Nai province coordinated extracurricular activities this month to reinforce road safety knowledge among their students. Activities included fashion shows, role playing, trivia, and drawing. Johnson & Johnson sponsors Helmets for Kids at these schools, as part of its 140,000 USD commitment to the Road Safety Fund. 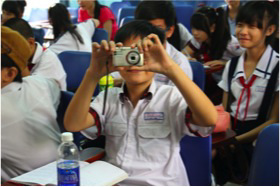 This month AIP Foundation trained 44 core students from Tang Nhon Phu, Phuoc Long, and Tran Quoc Toan secondary schools in District 9 of Ho Chi Minh city in road safety knowledge and photography skills. These students are participating in the Zooming in on Road Safety initiative, taking place for the first time this school year with the support of Intel Products Vietnam. Zooming in on Road Safety rallies students and parents to capture the reality of young road users. Five volunteers from the Intel Photo Club were on hand to facilitate the photography trainings and to offer feedback to the students on their snapshots. Events around the country on November 19th marked the first time Vietnam has observed the World Day of Remembrance for Road Traffic Victims nationwide. Mr. Greig Craft, AIP Foundation President, joined other well-known figures to share his experience for a documentary broadcast at the commemoration ceremony in Hanoi on November 19th. AIP Foundation also developed 10,000 booklets about the international activities recognizing this day, the traffic law in Vietnam, basic ways to protect themselves and other road users. 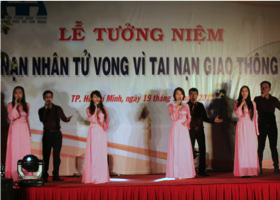 The Ho Chi Minh City Traffic Safety Committee, Youth Union, and Women's Association helped to distribute the booklets through 24 districts in Ho Chi Minh City. AIP Foundation and the Ho Chi Minh City Traffic Safety Committee co-produced In Retrospect, a documentary in memory of traffic victims, with the support of the FIA Foundation. The film explores the grief of the victims' families and carries a message to the public that this loss could have been prevented by wearing helmets. The documentary will be aired in December on up to eight TV stations nationwide. Various media channels also reached out to raise awareness of the day and of the repercussions of road traffic accidents around the country. The television VTV1 produced a film aired on November 19th, which included the input of Ms. Nguyen Dieu Nuong, National Program Manager for AIP Foundation. And in response to new traffic regulations and recent tragic accidents, Tuoi Tre newspaper featured an article (in print and online) about AIP Foundation Executive Director Ms. Mirjam Sidik on November 25th. The UPS Foundation has granted US$450,000 to the AIP Foundation to fund the existing Helmets for Kids program over a three-year period in Cambodia, Thailand, and Vietnam. The grant from The UPS Foundation, which spearheads corporate citizenship and philanthropic initiatives, will enable AIP Foundation to promote road safety and deliver safety helmets to 27,000 children who travel to and from school by family motorcycles in South East Asia. "Road safety is of paramount importance to UPS, as our drivers, 70 of whom are in Vietnam, are the front-line of our organisation. Trained in safe driving methods, UPS drivers are some of the safest on the road," said Jeff Mclean, General Manager of UPS Vietnam. 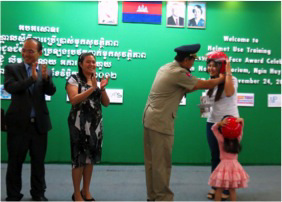 "We are proud that our ethos for safety extends to the safety of the local communities in Vietnam, and to be part of this program which raises public awareness, empowers teachers with knowledge and provides education and helmets for children." More than 400 youth, students, and artists joined the National Road Safety Committee, His Excellency Hun Many and the Union of the Youth Federation of Cambodia (UYFC) on Diamond Island to affirm the group's eager support of improved safety on Cambodia's roads. At the ceremony, sponsored by the Australian Government and the Asian Development Bank, AIP Foundation donated 300 hundred helmets to young people in attendance. Low helmet wearing rates among motorbike passengers play a major role in the increasing number of young lives ended early due to road accidents every year. Research demonstrates that non-helmeted motorcyclists are more than four times as likely to suffer fatal head injuries in case of a crash. While helmet use for motorcycle drivers is more than 80 percent, as few as seven percent of passengers, including children and young people, wear helmets. Last year, those between 15 and 29 years old made up nearly half of all lives lost on the road. Nearly 1,000 people in Phnom Penh gathered on November 18th to publicly mourn the 1,905 lives lost on Cambodia's roads every year. The National Road Safety Committee and Cambodian Red Cross partnered with AIP Foundation to observe the World Day of Remembrance for Road Traffic Victims. 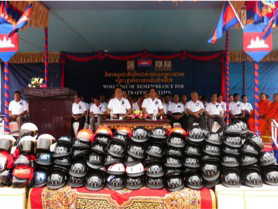 During the morning ceremony at the Olympic Stadium, the Cambodian Red Cross Youth performed a song in memory of road victims, and AIP Foundation handed over 200 helmets to vulnerable road users. Police, local authorities, monks, and citizens from nine districts in Phnom Penh also participated. AIP Foundation and the American Intercon Institute and School co-organized a helmet use training for AIIS students and the contestants in the AIP Foundation Paste Your Face photo competition. AIP Foundation also announced the photo competition winners and distributed awards. The contest, launched in August, received over 300 entries of photos featuring parents and their children wearing helmets on motorcycles. Photos that received the most 'likes' on Facebook were awarded top prizes. In addition to the organizers, Major General Kim Y Deth, Deputy Director of Public Order Department, joined General Commissariat of National Police, representatives of Dreamland Park, representatives of PTT Cambodia Ltd., and members of the media for the event. Road safety campaign widened – After 24 years of campaigning for road safety, Toyota Motor Thailand launched the cities-with-safe-traffic campaign last year in Bangkok. The new campaign will be extended to 25 provinces. In September, Nakhon Nayok became the 21st province to join the campaign. A delegation from AIP Foundation traveled to Udon Thani, where the UPS Foundation will support Helmets for Kids implementation. The team met with and received commitments of support from high-ranking government officials and business people, as well as community leaders and celebrities in the project area, including the Governor, the Director of Udon Thani Primary Education Service Area Office 1, representatives from Udon Thani Rajabhat University, the Provincial Police Commander, the Chairman of the Udon Thani Chamber of Commerce, and school officials. The kick-off ceremony for the initiative will be held on December 27th. 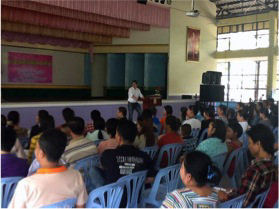 On November 9th and 10th, Ratanawadee Winther, AIP Foundation Thailand Country Director, and Michael Florian, Regional Monitoring & Evaluation Manager, introduced the Helmets for Kids program at a parents' meeting hosted by Ban Makkhang School. 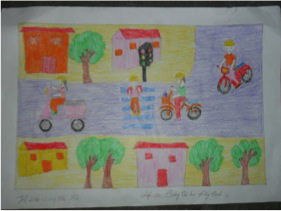 AIP Foundation aims to engage all parents to participate in and support the road safety program in their community. Over both days approximately 1,200 parents attended. Ratanawadee Winther, Thailand Country Director, represented AIP Foundation at the government's World Day of Remembrance for Road Traffic Victims event hosted by Department of Disaster Prevention and Mitigation, Ministry of Interior at the United Nations office in Bangkok on November 18th. Approximately 50 people participated in the event. Representatives from the UN and road safety stakeholders delivered speeches about road safety in Thailand, and attendees placed white paper flowers before pictures of the victims from road accidents. National Traffic Safety Day announced – The Ministry of Public Security (MPS) has confirmed that December 2nd will mark China's annual National Traffic Safety Day. MPS explained that this day was chosen because 122 is the emergency phone number for traffic accidents and because, as winter begins in China, the number of accidents increases due to the weather conditions. 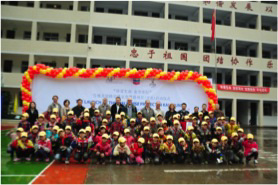 On Friday, November 9th, Chevron, Ltd. launched Walk Wise, a partnership with Asia Injury Prevention (AIP) Foundation, Kai County, as well as students and teachers to create a safer pedestrian environment at Gaoqiao and Qili primary schools. Walk Wise will pilot a new road safety curriculum, informed by international methodologies and written in collaboration with teachers at the two schools. The Walk Wise launch ceremony at Qili Primary School gathered county officials, police, the Department of Education, Youth League, school administrators, parents, and Chevron representatives to promote road safety in the local community. Nearly 2,000 students received yellow caps to improve their visibility on the road. 'Road accidents claimed 3,343 lives last year – After a protracted debate on Wednesday during which one MP after another vented out anger against government for failing to curb high road accidents in the country, parliament passed a motion instructing the executive to take immediate measures to address the problem. On November 21st, the Ugandan government took a significant step toward safer roads with a parliamentary motion for a government plan to implement the Decade of Action for Road Safety. The week of November 18-24 was observed as National Traffic Safety Week in Uganda under the theme, "Uganda at 50 with Safer Road Users." The Ugandan Helmet Vaccine Initiative (UHVI) worked closely with high-level government officials, including the Parliamentary Forum for Road Safety, Minister of Works and Transport, the Inspector General of the Police, and the National Road Safety Council, to coordinate the week's events. 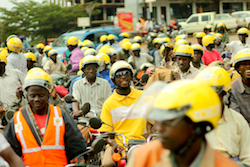 UHVI invited 100 boda boda motorcycle taxi drivers, who had received UHVI training, to participate in the government procession through Kampala. UHVI concluded National Traffic Safety Week with a motorcycle safety training workshop with free helmet distribution for 100 boda boda operators on November 23rd. Trainings for 900 more boda boda drivers are planned for the coming months together with a media campaign.